This time last year, I put together a list of what I like to call New DIYear Resolutions – household projects I wanted to accomplish in 2010. Now that it’s a year later, it’s time to take a look back at how we did. I’ll be sharing updated photos on each of these goals soon, but for now here’s the scoop on how the year went. 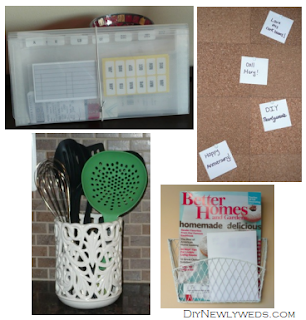 Get Organized: My first resolution was to get organized. This wasn’t to be an overnight job, but something I did throughout the year to get organized and stay that way. I’m happy to say that I made some great progress on this resolution and cleaned out some closets, drawers, and came up with a better system to organized my household paperwork (you can check out some of my home organization projects here). However, there are definitely still areas of the house that could use organizing. I think this is one of those goals where there’s always room for improvement and better solutions will always come about as we live and learn, so this resolution is staying on my list for 2011. I’ll be sharing some more of the organizing techniques I came up with in 2010 soon, but this goal isn't going anywhere in 2011. Finish Updating Our Kitchen: Check! 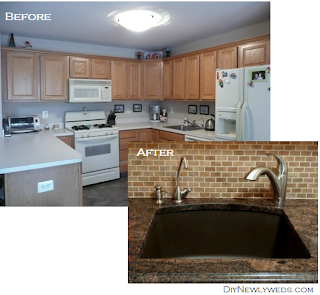 We installed a new backsplash, granite countertops, sink, and painted. There’s still the eternal debate of if we should paint, stain, or leave our cabinets alone, but other than that the kitchen is in pretty good shape. It’s about time I shared some new photos though! New Fireplace Mantle: Another check! 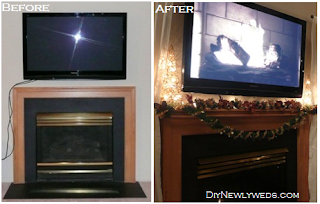 We installed a wider fireplace mantle shelf to add some style and function to our builder’s grade mantle. I really enjoyed styling the new mantle for Christmas this year. I still want to paint over the brass accents and tiling the black surround still sounds appealing, but for now we’ve definitely taken a step in the right direction with the fireplace. 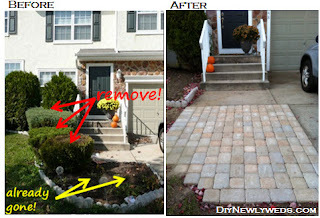 Front Yard Landscaping: Just a few months ago we tackled our front entrance by adding a stone paver walkway and removing some boring looking shrubs (check out part 1 and part 2 of this project). I still owe everyone updated photos of this endeavor, but in the meanwhile check out the sneak peak below of our new walkway. However by the time we finished installing the walkway, it was too late in the season to plant new shrubs and flowers so that is definitely on our to-do list for the Spring. Home Office Update: Another check! I’ve been a little mysterious about this goal, but I’ve been secertly revamping my home office space which I’ll be sharing soon. For now, I'll just say that it involves an old desk, white paint, and very cute new accessories! Basement Improvement: Fail! This is the one goal we didn’t do much with last year. My goal was to come up with some creative solutions to make the space look more finished without actually finishing it (with paint, fabrics, etc) but I have yet to come up with a good solution. However we did add some shelving units which gave us more functional storage, but I’d still like to do something to add some style to the basement. This one is going back on the list for 2011. How did you do with your 2010 resolutions? Are you making new resolutions for this year? Stay tuned, I'll be sharing my 2011 New DIYear resolutions soon. I didn't make any resolutions in 2010. For 2011, I am resolved to make the best of each day and to learn/visit something new each month. Love your kitchen countertops and sink! Don't paint/stain your cabinets. It's A LOT of work. (We're in the middle of that right now.) I would consider painting your walls black. It would really make your cabinets pop and enhance your granite. La- that's a great resolution! One thing I want to resolve to do is to try more new things. I love that you're setting a monthly goal for that, great idea! MarriedM- that's what I'm afraid of! It looks like such a time consuming job to paint the cabinets and to make sure to do it properly. And I hate having my house torn apart during a big renovation. But I would love the look of crisp white cabinets!